Like the calm before the storm, Day 2 of the 2007 Dodgeball Tournament hit like a Category 5 as the action didn't stop for the entire afternoon. The caliber of play, the speed, the intensity on and off the court, and the stakes rose to unprecedented heights as 2007 will definitely go down as one of the finest tournaments to date. When the dust settled the expected finish did come to fruition as the Mighty Morphin Power Rangers, who came in as a heavy 1-5 favorite, completed the 'Back to Back' as the former Walker Texas Rangers seized their second straight title. Pat Daddino, who battled a sprained ankle which he injured in the semi-finals was named tournament MVP. The Morphins title notwithstanding, their road to glory was anything but expected as upsets were all the rage on Day 2 and no one drew more attention to their underdog role then Brian Fusco's Dodge These... Balls whose 1.6 Million-1 odds drew more than a few chuckles until they walked away with victory after victory. A throw in team that was given permission to sign up late started their quest with an upset of WATC. They followed that win with a classic over Los Presidentos Muertos who were labeled with some very clever names. Next came the Got Dodge...Balls crew, who were on their own little run to the top, before knocking off the Legends of the Hidden Temple whose colorful uniforms would have complemented the Morphins nicely. When the David vs Goliath matchup finally arrived there wasn't a fan in the building who wasn't pulling for Dodge These...Balls. A game one win for 'Dodge' in the best of five only added to the bedlam, but then as game two was winding down the turning point of the tournament occurred. Rob Bruno, who was a solid Day 2 addition, got caught up in the moment and created a situation that no one, especially the Head Referee Mr. Hedquist ever wants to deal with. Rob, with 700-800 students watching, was eliminated by a thrown ball yet continued to play for nearly five to ten seconds. In the eyes of Mr. Hedquist this was a Cardinal Sin. The ensuing decision was a team forefeit despite the fact that it was the finals. It was a predicament that every referee dreads. To affect an outcome of a game is very tough to follow through on but in this instance it was decided that the tournament's credibility was at stake. In addition, Rob's action definitely prevented the Morphin's Mike Sands from getting a free in close shot at an unprotected pin. To Rob's credit he accepted the penalty and apologized. A classy move by a classy kid who made a poor choice at a crucial time. With the games at 1-1, the Morphins routed the 'Dodge' team in game three and were well on their way in game four before the Dodge team pulled together again as Captain Fusco shot down three Morphins to push it to Game 5. So here it was for all the marbles and the 'Dodge' team starts off by taking down 2006 MVP T.J. Humrich. The windows in the top of the gym were rattling by this point and the crowd was juiced. 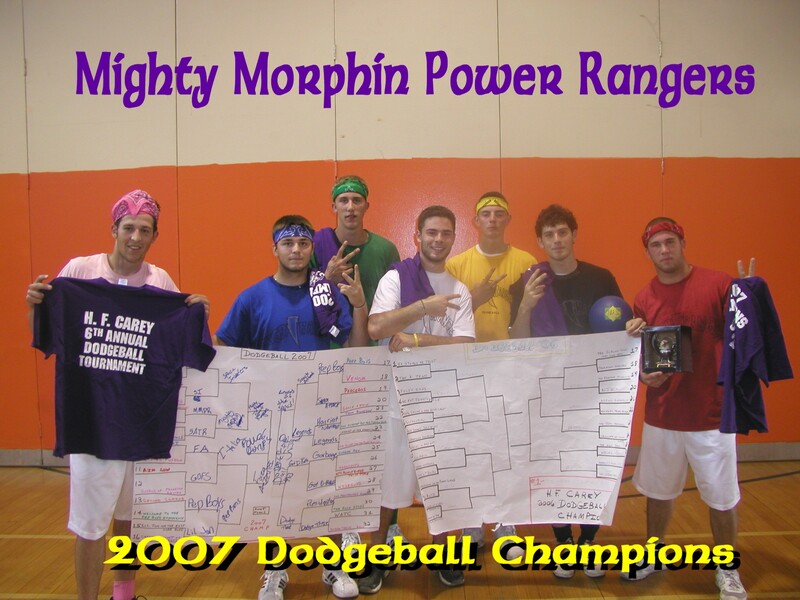 Unfortunately sometimes the fairy tale has to end as the Morphin team led by Sal Intagliata, Mike Aquino, Anthony Marino and Matt Zaffuto quickly got Humrich back in the game and staved off one last rally by Anthony Lapelosa to claim their prize as 2007 Kings of the Court. Congratulations on a spectacular accomplishment and enjoy your steak dinners at Boulder Creek. Of course there were other classic moments for teams that didn't win. Most notably was the Pep Boys vs Forza Azzurri matchup that might go down as the greatest 2 out of 3 series in Dodgeball history. Like a gunfight at the OK Corral these two teams fired off rocket after rocket in three straight games including one mano y mano that ended with a Forza win. It was the epitome of Pep Boys grit who just one game earlier ended the careers of Lil Jon and the East Side Boys whose Captain Chris Ruvane, formerly of Rick James' Disciples, had to have Captained three of the best teams to never win a title. In that same breadth, Harriet Tubmen and the Garbage Men, who are both loaded with talent, again fell short. Their losses were identical in the magnitude but only the Garbage Men's was shrouded in controversy as the belief that an errant pin was credited twice dampened their day. It is unfortunate if it went down that way but you still have to take care of business so a poor call doesn't affect you. Not missing a beat was the first ever Girls Championship in which Jackie Valvo's Princesses swept Alexis Medina's Feel Good Revolution 2-0. Their gusto in being the first Girls to compete in the six year tournament was not lost on the crowd as they were cheered and supported wildly. All in all it was an A+ event as no one was seriously injured, record teams and crowds showed up. The Carey administration was thrilled with the behavior and excitement generated by the student body. The Seniors, as well as the underclassmen were able to 'show off' for their friends one last time. And lastly, a good time was had by all. *I would be remiss if I didn't thank the following individuals for making this tournament possible: Mr. Monaghan, Mr. Quinlan, Ms. Flynn, Mr. Kenny for allowing us to play. Mr. Soto, Mr. Farina, Mr. Giarraffa, Mr. Habart, Mr. LaMarca and Ronnie Pickett for Officiating. We honestly did the best we could and do not plan on quitting our day jobs! To Mike Mollish, Steven Piccolo and Tim Maccarone for providing the music. To Mike Multari, Ciro Taormina and Pat Castel for taking pictures and videotaping. To T.J. Humrich for providing us with another Dodge Ball. To be quite honest, Day 1 of the 2007 Dodgeball Tournament brought a whole lot of style but not much substance. Eight out of the top ten ranked teams moved on with easy victories. Of them, only the Garbage Men were really challenged as the Headshots stole game one before dropping the next two. There were however two upsets as Second Coming was the First Going as the Senior Laden Pep Boys simply refused to leave their Dodgeball career winless. The other huge upset was the Got Dodge...Balls defeat of the Wiseguys whose long practices and hard work at the local elementary schools simply didn't translate to the big show as they were surprisingly swept away in straight sets. As expected many of the new teams brought a very unaggressive approach to the table as they felt their way through day one. The slow pace, though expected, necessitated the use of the Orange Line for the first time in Dodgeball Tournament Play. In fairness when you are playing in front of such a big crowd for the first time you can lose a bit of focus. Those rookie cobwebs should be gone by day two. So for teams like Aqua Teen Hunger Force, Space Invaders, Guidos of Franklin Square, Spanky and the Rascals, Snack Attack, Prep Boys, Legends of Hidden Temple Dodge These...Balls and Los Presidentos Muertos you've got the first one out of the way now it is time to make a run. For teams like the Mighty Morphin Power Rangers, Harriet's Tubmen, Lil Jon and the East Side Boys and the Garbage Men the scary first rounder is also over now it is time to stake your claim as 2007 Champion. The action and intensity will definitely pick up on day two as the Gene Simmons from Kiss show becomes a serious battle for Dodgeball supremacy. For the record Mr. Hedquist was only 9-7 as the Swami on Day 1 but his Final Four are still intact so lets see if somebody can break through and stir up a few upsets. With just two days of hype remaining before the '07 Dodgeball Tourny takes to the Carey hardwood I felt it was time, after some prodding by about 300-400 students, to go on the record and give my thoughts on how I think things will turn out. First I want to congratulate the two girls teams for being the first to venture into the 'pit.' It takes a lot of courage. Now having said that I expect Feel of Revolution (I think that's their name) to prevail in straight sets over The Princesses in the inaugural Girls Dodgeball Championship. As for Boys Dodgeball Championship, I really don't expect many upsets. I think the tournament is more top heavy than ever before which is good and bad. It is good because if there is an upset it will be an earth shaker. It is bad because if all goes as expected there will be quite a few blowouts which is bad for business. Afterall the crowd wants to see action not 7-0 shutouts. In the Monaghan bracket I just don't see anyone challenging the Might Morphin Power Rangers who have 4-5 scholarship athletes on the same team and WILL become the first ever repeat Champions. The only hope in that bracket is if they come out cold then maybe, just maybe, the Take Notes boys could sneak up on them. Other teams in that bracket to watch are Spanky and the Rascals who should win one before bowing out, and the Space Invaders who have a really easy ride to the bracket final before they run into the Morphin buzzsaw. The Quinlan Bracket gives the most hope to teams hoping to advance as there are no real powerhouses or real weak teams. Just about anyone can make a run to the final four through this bracket. However, I expect Lil' John and the East Side Boys, who have had tough losses in the past, to finally get over the hump and reach the Conference Final before falling to the Morphins. Now, I do think Forza Azzurri could trip them up in the bracket final where I believe they will be. Of course Second Coming and the Pep Boys will also be very dangerous as they are both loaded with good athletes but that doesn't always mean they have what it takes to win in Dodgeball. Shifting gears to the Flynn Bracket there is no way How Harriet Got Her Tubmen Back is going to come in overconfident as they did a year ago. They are hungry and they are dangerous and I believe they will win the bracket in a rout before edging their way into the Championship round where they will lose to the Mighty Morphins in four. I like the Legends of the Hidden Temple roster but they are no match for Harriet. Good vibes for Venom and Parceros who will win games before being rudely evicted from the real title chase. In the last bracket, the Wright Bracket, you've got the Garbage Men who are real talented but possibly undisciplined. You've got the Wiseguys who are undisciplined, and you've got WATC who are the unknown and will not be respected, but should be. I think the Garbage Men will just get by the Wiseguys and the surprising WATC team to reach the Conference final where they will fall to Harriet. I do however think that every student in Carey High School will be rooting for the Rock Stars and if they should advance it might cause the gym's roof to blow off.